The growth of a European bioeconomy will require an increased supply of sustainably produced biomass. 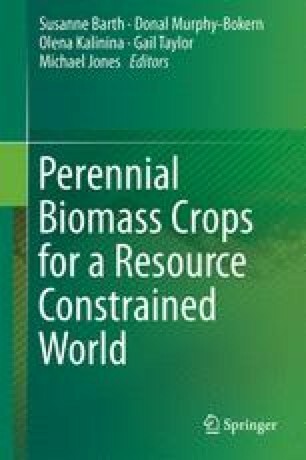 The aim of this chapter is to discuss how perennial biomass crops (PBC) can contribute to the sustainable intensification of agriculture and the sustainable supply of biomass in Europe. Farmers’ interest and acceptance is low. These challenges can be overcome by the development of (among others) efficient and stress-tolerant PBC cultivars, efficient and low-cost crop management and agricultural technologies, and high-value applications for lignocellulosic biomass. Significant potential for the production PBC in the EU is seen in the use of marginal or contaminated land. These soils can even be ameliorated by PBC. Other opportunities include the integration of PBC into farming systems. This can help farmers make better use of land that is less suitable for food production and at the same time improve its ecological performance by, for example, reducing nitrate leaching or erosion. There is also considerable potential for PBC to replace less sustainably produced biomass. An example of this is miscanthus, which can replace maize as a biogas substrate. These opportunities should be accompanied by the development of high-value applications and the on-farm biorefining of PCB biomass.